Yes, it’s true, ladies and gentlemen. Scientists agree that the lowly chimpanzee is more closely related to humans than to gorillas. See if you agree from the pictures below. Hacia. (2001). Genome of the apes. Trends In Genetics 17(11): 637-645. What follows then is the type of genetic sequence analyzed, % similarity between humans and chimps (HC), % similarity between humans and gorillas (HG), then % similarity between chimps and gorillas (CG), in that order. And so we see that HC is closer to CG by a whopping 1/2 of 1% (coding sequences)! 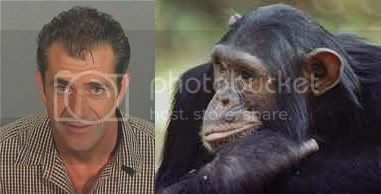 So of course, chimps are closer to humans than to gorillas, isn’t it obvious? (1) Why are there no ‘homonoid’ civilizations in existence today? There are human civilizations, and there are ape ‘clans’, but there is nothing “in between” alive today. (2) The fossil record of supposed human ancestry is equivocal at best and can just as easily be explained as either human fossils or ape fossils. (3) There are enormous non-physical differences between apes and humans, i.e. in apes there is no complex language, no religious propensities, no arts and sciences, no technology, no moral code, etc. etc. No, my friends. Apes are apes and humans are humans, and as far as anyone really knows for sure, that’s the way it’s always been.